Does business intelligence still point to labour market slack? One of the puzzles arising from the economic recovery has been the difficulty of squaring sharp falls in unemployment with – at least until recently – only slow growth in average earnings. The common interpretation is that there’s still more slack than “normal” in the labour market. However, in this post, we argue that there has been a more marked labour market tightening so that there is now slightly less slack than “normal”. That suggests that earnings growth has been suppressed by factors other than labour market slack – leaving a risk that wage inflation will pick up sharply if and when those factors wash out. Our argument is based on the business intelligence gathered by the Bank’s network of agents across the UK (of which the authors are a part). Agency staff visit around 460 businesses each month to explore the economic issues facing the firms and draft a confidential report summarising the contact’s story. Since late 2007 the network has also assigned Company Visit Scores (CVS) – on a scale of -5 to +5 – for a range of variables such as turnover, recruitment difficulties and labour costs. For recruitment difficulties, the network assigns positive scores where firms talk of “above normal” recruitment or staff retention challenges. In this post, we use both the CVS and the visit reports to explore the significance of contacts’ concerns about recruitment difficulties. While both the write ups and CVS used in this post are unpublished, the Bank made a dataset of historic anonymised CVS available as part of the One Bank research agenda. 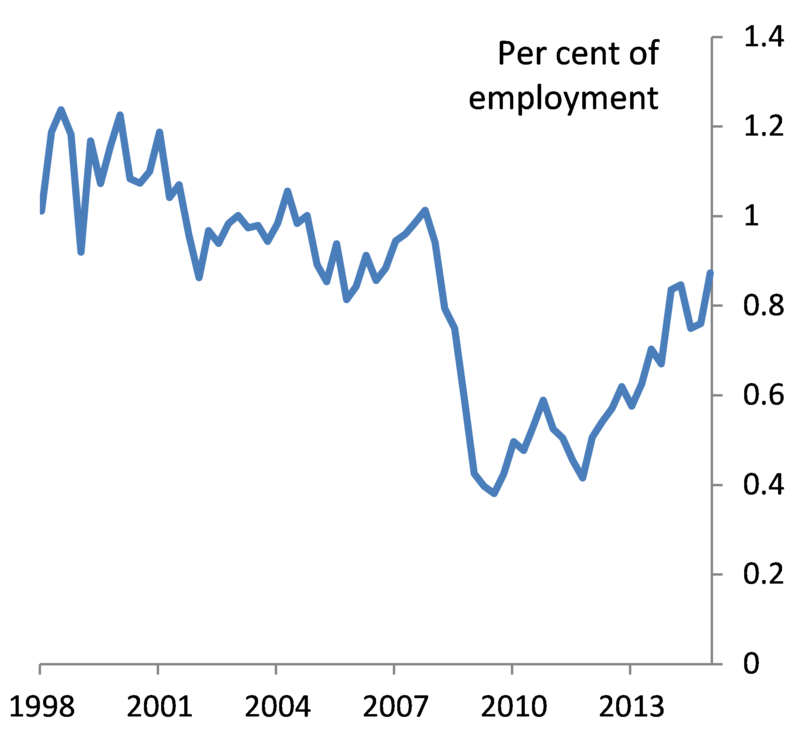 The labour market has tightened – but how far? Over the past year, the proportion of firms scored as “tighter than normal” for recruitment difficulties has risen substantially, with the average scores moving into clear positive – “above normal” – territory (Chart 1). The increase in scores is common to contacts across all parts of the UK and from firms operating in a broad range of sectors. It’s no surprise that recruitment/ staff retention has become less easy than was the case at the height of the recession; indeed, a host of labour market statistics suggest a degree of tightening as unemployment has fallen from its peak. 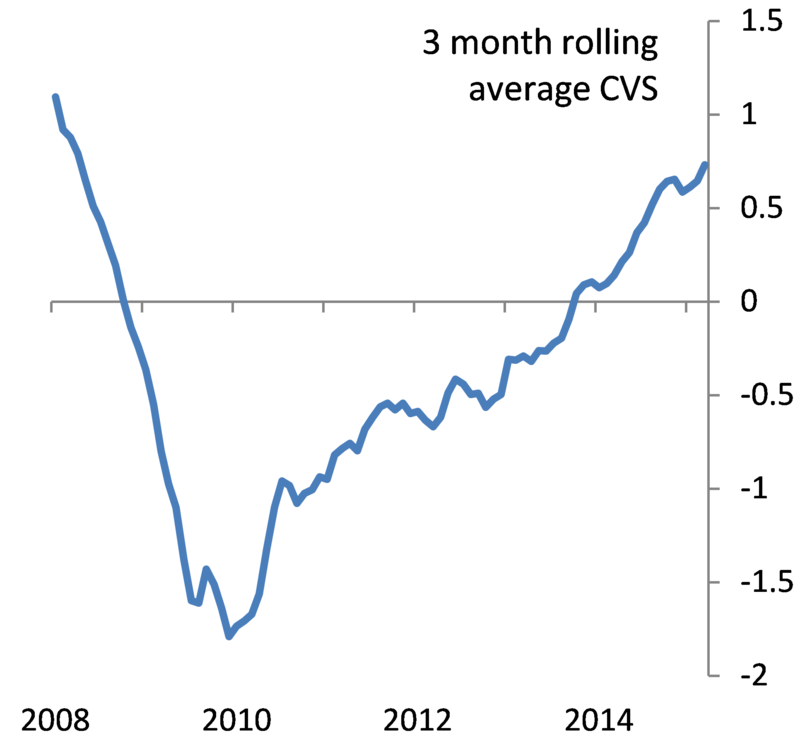 But many official statistics continue to point to greater than normal levels of slack. For example, while data on job-to-job flows (staff churn) have picked up, they remain below their pre-recession average (Chart 2). This raises the question of how to reconcile the wedge between “above normal” Agency visit scores for recruitment difficulties and those official statistics which still indicate slack. The difference of view boils down to whether to take the “relative to normal” scoring reference point for the CVS at face value or to normalise scores on the basis of time-series properties (as is routine when analysing survey data). To be confident that “above normal” scoring really reflects a tight labour market we need to be sure that those firms describing recruitment as abnormally difficult are both well-sighted on what they would regard as “normal” for their industry and had taken some sort of strategic response to the staffing challenges they describe. When the analysis in this post was first prepared for an internal audience – in 2015 Q1 – we looked for reassurance that contacts were well sighted by holding in-depth discussions with firms that focussed exclusively on recruitment difficulties; analysing the stories behind the stories recorded in the Agencies’ confidential visit reports, and carrying out a richer inspection of the CVS dataset. During 2015 Q1, we undertook 40 in-depth discussions with firms – focussing our discussion exclusively on recruitment difficulties. Most of the people we talked with were experienced HR staff, as well as a number of recruitment agencies. In most cases, these well-sighted contacts were explicit that recruitment or retention of the skills they required was more difficult relative to pre-recession norms. Our interviews also suggested a degree of mismatch in labour markets. For example, while unskilled staff were still readily available at the time, firms struggled to fill skilled roles. Contacts talked of a number of factors that might have made recruitment of skilled personnel more difficult than normal. One common theme was the major impact of the recession on both the supply of – and demand for – skills. During the recession, deep cuts were made to graduate and apprentice intakes, opportunities for progression were more limited, training budgets were cut and experienced staff were made redundant. This ‘supply-side shock’ has contributed to a skills mismatch – increasing the supply of a few skills, but for many contributing to widespread shortages of specific skill sets. Other factors included: The demand for digital skills; the regulatory environment; and less willingness to work in industries with unsocial hours or physically demanding roles. If recruitment issues are binding “more than normal”, we might also expect to see this reflected in firms’ behaviour – what responses are they taking to deal with the challenge. The confidential records of each visit give a window on the issue – outlining the key points discussed, including the explanation of the trends the firm has experienced and any strategic responses being taken. The text reveals the stories behind the CVS. We read systematically through all Agency visit records for firms scored as “above normal” for recruitment difficulties, to identify the most common strategic responses (Table 1). Our systematic reading of visits from late 2012/early 2013 revealed that even those scored as “very tight” (+3 or higher) for recruitment were often taking no clear strategic response – at least, not sufficient to be picked up clearly in our visit write ups. Firms were also reluctant to make use of higher pay in order to retain or recruit staff. For example, they would prefer to hold positions open for longer in the hope of finding the right quality people. Revisiting this analysis for firms scored as “very tight” in 2014 Q4 revealed that a smaller minority had failed to identify a clear strategic response. Strategic responses were also now more likely to take the form of higher pay awards targeted at new recruits and existing staff with key skills. And, perhaps more tellingly given the preponderance of firms scored as “slightly tight”, the 2014 Q4 visits also revealed a more widespread pay response to recruitment difficulties for all firms scored positively than we found for extreme positive scores in late 2012/ early 2013. Because the CVS are assigned for each visit they can be used to explore relationships between different aspects of firms’ experiences, including whether firms reporting recruitment difficulties were experiencing above-average inflation in their per capita labour costs. Chart 3 groups firms together according to their score for recruitment difficulties (-5 to +5) and reports the average CVS for per capita labour costs of firms in each bucket. 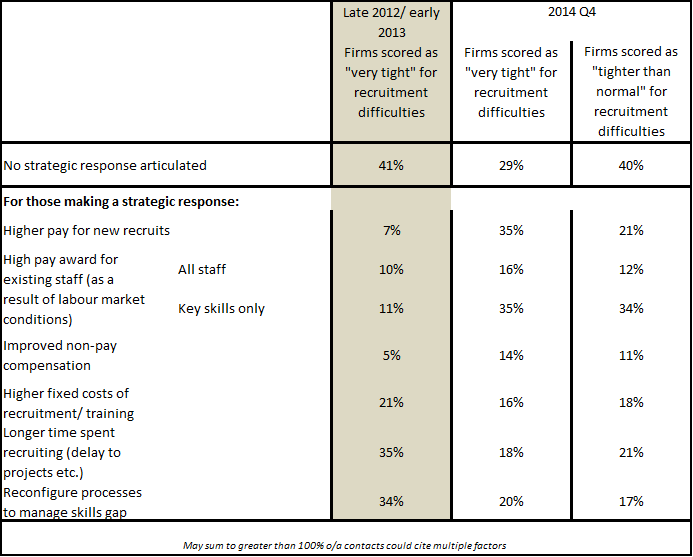 The area of each bubble indicates the proportion of firms reporting a given recruitment difficulties score. 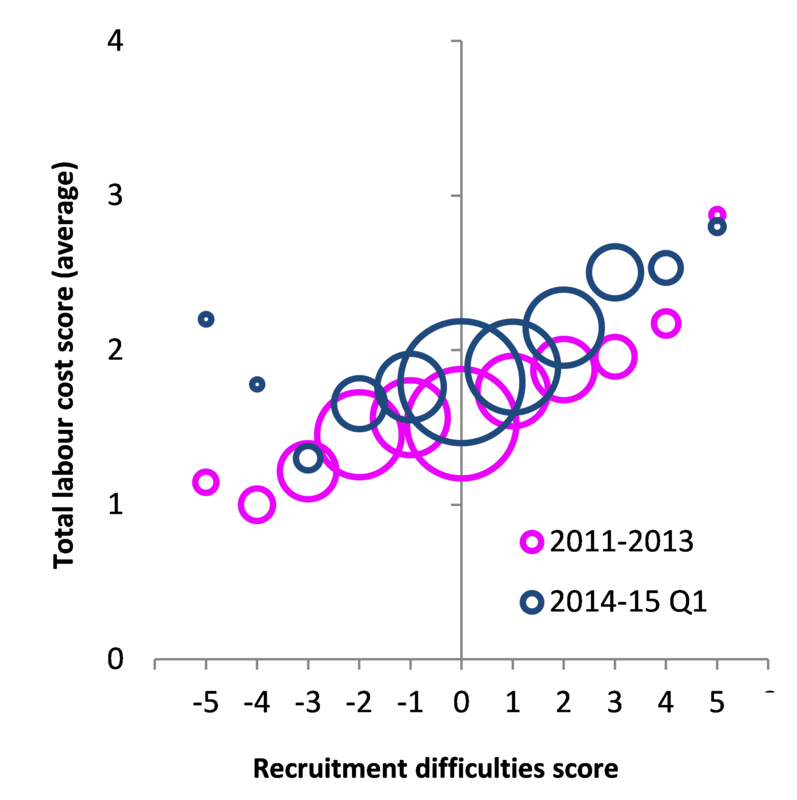 Our analysis suggests a recent steepening of the relationship between per capita labour cost and higher recruitment difficulties scores relative to the relationship seen between 2011 and 2013. This finding is consistent with the Agents’ February 2015 survey on pay – where recruitment/ retention difficulties were widely cited as the key upward driver of total labour costs. This leads us to argue that the Agents’ Company Visit Scores – which suggest firms have been finding recruitment more difficult than “normal” – can be taken at face value. Our view is based on further analysis of the Bank’s business intelligence which shows that firms: a) provide a coherent and consistent narrative to support their view; b) appear to be sufficiently concerned by recruitment and retention issues to be taking specific actions; and c) have seen the most rapid growth in per capita labour costs in cases where recruitment difficulties were reported, with higher pay awards targeted at new recruits and existing staff with key skills. As a result, we believe that there is little – if any – slack remaining in the labour market and that the potentially inflationary impact of a tightening labour market is therefore being offset by other factors. These might include compositional changes within the workforce, lacklustre productivity growth, softer hiring intentions, constrained margins and the impact of low CPI inflation on pay bargaining. That matters because it suggests a risk that wage inflation will pick up more sharply if and when any of these factors ‘wash out’. Authors: Alastair Cunningham and Glynn Jones are economists who both work in the Bank’s Inflation Report and Agency Intelligence Division. Previous Post Who benefits from the implicit subsidy to ‘too big to fail’ banks?